As the recent devastation from Hurricane Sandy has made tragically clear – our country’s infrastructure weaknesses need to be addressed in a fundamental and decisive way. The super-storm laid bare the frailties of modern life and showed that we have to invest in, and modernize, our nation’s infrastructure. This is especially true of our water and sewage systems that we all rely on to provide us with clean water and wastewater removal. 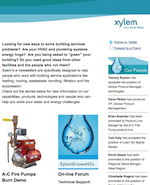 That need was reinforced this week when Gretchen McClain, Xylem’s president and CEO presented the findings of the 2012 Xylem Value of Water Index. This is the second installment of the Value of Water Study and is complemented by independent research from the Columbia Water Center. McClain stated, “Keeping our water systems running efficiently to provide safe water to our citizens must become a national priority, and as the Index demonstrates, a majority of Americans agree. This unseen crisis must become a shared responsibility. “We have to strengthen our basic foundation – from flood control to our water systems and their role in protecting other parts of the infrastructure – and we have to leverage new technologies to make our equipment more intelligent and energy-efficient as a cornerstone of the 21st century economy,” said McClain. America loses 1.7 trillion gallons of water each year due to water main breaks at an annual cost of $2.6 billion. 36 states are expected to face water shortages by 2013. We can no longer afford to take access to water for granted. Population growth and urbanization are placing pressure on our water supply—demand will increase 5 times by 2050. 97 percent of Americans consider water an important service, on par with electricity and heat. Nearly 90 percent of those polled say U.S. water infrastructure needs reform, an eight percent increase since 2010. Nearly 90 percent of Americans believe the government should be accountable for fixing and maintaining our water infrastructure. 85 percent of Americans want greater government investment in water infrastructure upgrades.